I'm always on top of annual appointments and go to them without fail. So, right after the first of the year I scheduled my yearly ob/gyn appointment. I walked away from that appointment scheduled for my first mammogram and because of some test results a referral to a gastroenterologist. I've been a very healthy person for a long time, so I see my ob/gyn doctor and usually don't bother with a primary care physician. Well, I turned 40 this year and I decided it was probably time to have a physical. When I went last Wednesday, everything seemed fine. On Friday, I went for the gastroenterologist consult and left that office with a scheduled colonoscopy (for tomorrow). I walked out of there and went straight to my new primary care office to complete my lab work. I received a call later that afternoon saying I needed to go pick up antibiotics for a bladder infection, needed to change my diet and exercise because my LDL was borderline high, and I was anemic. They called back yesterday telling me I needed to pick up a prescription for iron. And I thought I was going to get to do over-the-counter. I'm a mom with three kids, being tired is just something I take for granted. I have noticed feeling more tired as of late and sleeping a bit longer, but I didn't really think about iron issues. This is why you need to have those annual appointments. They help diagnose issues that maybe you didn't know about. That you just kinda dismiss instead of getting a medical opinion. I'm not one to run to the doctor for the sniffles, but preventative care is important. I have been very bummed out and anxious the past couple of weeks. I'm feeling old and tired. I've joked a lot with JP about "this is the reason why people saying getting older STINKS!" Every night, we sit together and write in our thankful journals. It reminds me and centers my thoughts on who is really in charge. I'm thankful my pap smear and mammogram came back normal. I'm thankful that I was able to schedule my colonoscopy early, so it didn't interfere with an upcoming event. I'm thankful that I have good doctors that I can trust and that call you personally when there is a problem. I'm thankful that I know God is with me and taking care of me no matter what! I'm thankful for good friends who offered to watch the kids on Wednesday, so JP can accompany me without worry. I'm thankful for a good book that has been distracting me from some of my anxieties. Brown meat in a skillet and cut into small pieces. Peel and dice potatoes into small pieces. Put into a saucepan covering with water. Add the mixed vegetables and cook until potatoes are slightly tender. Drain. Add the sauce and vegetables to the meat and stir. 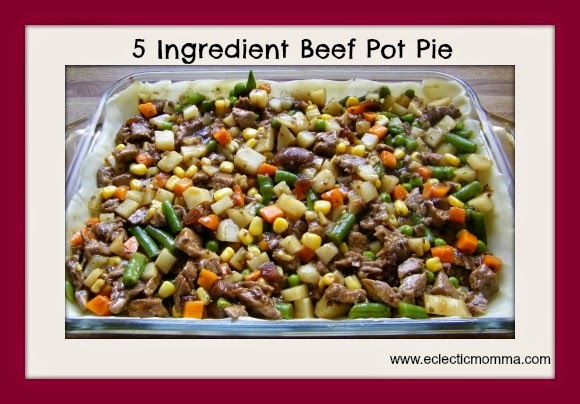 Press out one pie crust into the bottom of a 9 x 11 inch casserole dish. Top with other pie crust pressing the sides into the casserole dish. Cut a few slits into the top. Bake for 30 minutes or until the crust is golden brown and sauce is bubbling. I’m the proverbial worrywart! “What if’s” can plague me on a plethora of subjects. Maybe it’s because I overthink situations, circumstances, changes or maybe it’s because I don’t let myself be informed enough with the TRUTH. Maybe a bit of both! There are several situations and changes that have come up in recent days. A health issue that needs to be checked out, a new promotion for my husband, more responsibilities in volunteer organizations and the demands of life as a homeschooling mom. It’s amazing when life seems overwhelming that God speaks to us through His word even more. Even when circumstances don’t change, God is still with us and taking care of us. I’ve been reminded so much lately of His care as scriptures come to me. “Therefore I tell you, do not worry about your life, what you will eat or drink; or about your body, what you will wear. Is not life more than food, and the body more than clothes? Look at the birds of the air; they do not sow or reap or store away in barns, and yet your heavenly Father feeds them. Are you not much more valuable than they? 27 Can any one of you by worrying add a single hour to your life? 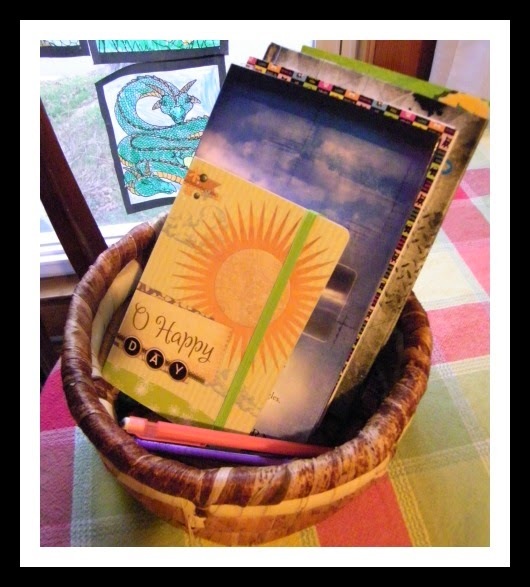 Every year, I spend the month of November giving thanks on my blog. It makes such a difference in the way I think about things, situations, and circumstances in my life. Impressed with how much my thinking changed, I wondered what would happen if we (as a family) made it a daily practice to give thanks. Not just in our prayer, but to actually journal our thanksgiving and praise. For Christmas, I purchased each person a journal. I tried to make it fit the person receiving the journal. Each evening around dinner, we will write at least three things we are thankful for from that day. We'll share at least one thing we've written down. A month of chronicling my thanksgiving on my blog changed the way I think. As a family, I want us all to share in the experience. It's also something to look back upon when days are long and things are not quite going the way we'd like. It teaches our children that "every good gift is from above" and to "give thanks in all circumstances." I hope to update and share on a monthly basis. Why not join us in our year of thanks? I can guarantee you won't regret it! I finally found my new headboard! It was delivered yesterday and I love it! We bought a matching dresser, but it had to be ordered. JP finished the wall in our bedroom a while back. I'll post before and after pictures when we're done decorating. It was an exciting day! We've been celebrating at home with our little family the past few years. Usually we have some kind of cheese dip with chips and/or crackers. Tons of junk food basically. This year, my husband requested we do something a little different. So, we splurged on toppings for homemade pizza and had fruit and veggie trays with dips. So much improved over previous years. And so pretty, they begged to have their pictures taken. Everyone got at least one game for Christmas. We played games for over 4 hours---Codebreaker, Catchphrase, I Spy Eagle Eye, LCR (Left Center Right), I Say, Holmes, and Scotland Yard. The last two were my Christmas presents. Tera and Daniel took the instructions, figured them out and then taught the rest of us to play. Having teenagers is not too bad. Our littlest guy wasn't that interested in the games, he just kinda hung out, and snacked a little. Then, watched a short video before an earlier (later for him) bedtime. The older kids and dad stayed up to watch a movie, while I went up a bit early (late for me).